creates a luminous, singular beacon from myriad vantage points. 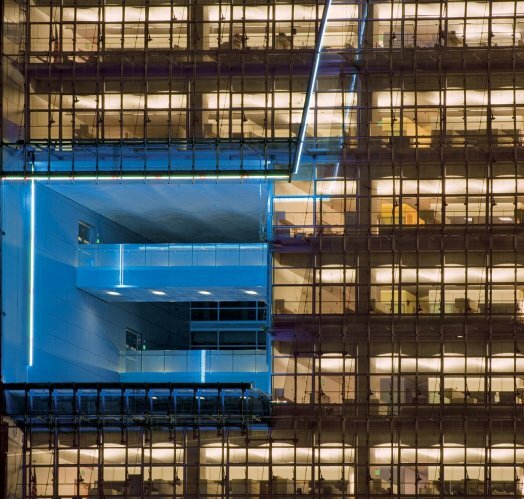 The three-story void appears as a glowing block of color set into the building; a ribbon of neon extends diagonally from the terrace up the façade of the building, following a seam in its perforated metal skin. Another band of light is embedded in the plaza at street level, completing the geometric figure that begins high up on the facade. is lit from dusk until 10 p.m. for exterior viewing. During daylight hours, the space provides views of the sky and surrounding cityscape from its terrace and a pair of suspended walkways. (To visit the San Francisco Federal Building you will need to show an American ID or international passport. for a more intimate glimpse of its street-level band of light running up the façade. Visit artist James Turrel&apos;s other artwork featured in Illuminate SF: Three Gems at the Babro Osher Sculpture Garden at the de Young Museum.